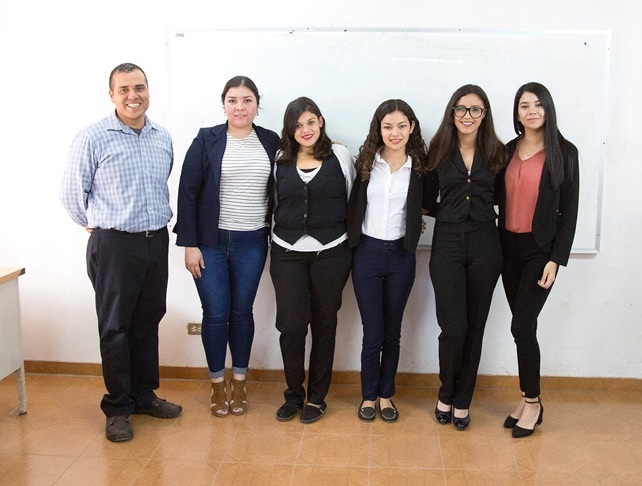 Board member Trini Rangel (left) presents five students of the Álamos campus of ISTECA (Istituto Technológico Superior de Cajeme) who gave their family histories during the Nov. 15, 2018, meeting of the Association. 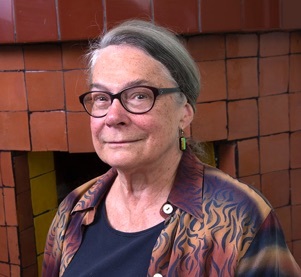 Ellen first visited Álamos in early 1973 while traveling south from her studio pottery business on the north end of Quadra Island, British Columbia. She resolved to spend her winters someday in Álamos and her summers in Canada. She especially appreciated the architectural beauty of Alamos because to her Master of Fine Arts degree in studio arts and further studies in art history. for her doctorate at the University of Arizona. After receiving a Ph.D in Higher Education (the study of colleges and universities) with a minor in art (which included studies in Pre-Columbian art, ceramics and art therapy) she became the Program Coordinator for the Composition Program of the English Department at the University of Arizona. Nine years after her mother, Leila Gillette, purchased a home in Álamos, Ellen followed her example and purchased a home in the same barrio. Ellen has taken an active interest in the history of Álamos since she retired in 2004. Born to a Canadian pioneer family, Gail Morden moved to the United States when she was nine and lived in and around Springfield, MA. The summer before she was due to start college her family moved to southern California, and Gail ended up at the University of California at Berkeley where she met and married her late husband, Rod Gully. Trini was born in Álamos August 14, 1981, in the barrio Guayparines on the western part of the town. 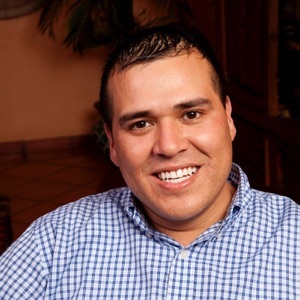 He attended grade and high school in Álamos, went to the University of Sonora at Navojoa, and graduated in 2000 with a degree in accounting. He has never worked in the accounting field, though, choosing instead to return to Álamos as a teacher in the Lázaro Cárdenas del Río and Revolución primary schools. Trini has 210 students in seven groups, teaching English to third through sixth graders. Olive Merrick. He spent six weeks in British Columbia through the generosity of the Merricks, but he largely mastered the English language the old fashioned way—by studying! Trini has received rewards for his innovative teaching, and is currently working on his master’s degree. For the Álamos History Association he is helping his students interview their elder relatives to document information about past days in this community. several years away from the West coast and her family, Gail moved back to the San Francisco Bay Area. She worked in the IT department of the Federal Home Loan Bank, where she specialized in developing financial planning and tracking tools. Gail visited Álamos in 2008 and moved here permanently in 2009. She is interested in Mexican history in general and the story of Álamos in particular, but after Rod’s death in 2017 she moved back to the United States. Through electronic communication, she continues to assist the work of the Álamos History Association. degree, writing about political culture in colonial India. Several years later she took a position in the History Department of the University of Oslo, Norway. In the Nordic region the overwhelming interest in ‘the third world’ was in development, so Pamela gradually began to focus on post-colonial India in her research and writing. She took part in academic institution-building activities in Norway and other Nordic countries, enjoying getting to know scholars and students from other parts of the region. Visiting her mother, Leila Gillette, in Alamos in 1999, Pamela decided to buy a house on the same street. 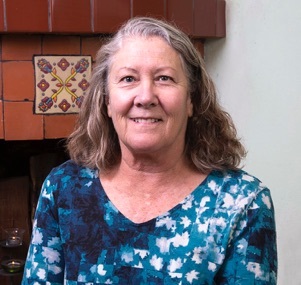 She retired from the University of Oslo in 2013 and has begun alternating between living in Alamos and Oslo. Learning about colonial Mexico and the Sonoran natural environment gives her great pleasure. Pamela Price became interested in history at a young age and dreamed of travel. 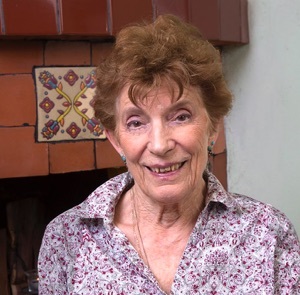 Chance gave her the opportunity to spend seven months at an Indian university in 1964-1965, and she decided then to become an historian of India. After graduating from college Pamela went to Cambridge University on a fellowship. The upheavals of 1968 got her off the academic track, but taught her a lot about politics and culture. Errol Zimmerman of Phoenix, Arizona, has been deeply involved in Mexico since he began photographing Sonora more than 30 years ago. A retired educator, his passion for international understanding guided him to become a volunteer with the Phoenix Sister Cities Commission in the 1980s, and during the 1990s he served as a board member and later President of the Commission—coordinating cultural and business relationships between Phoenix and its 10 sister cities abroad. His interest in photography (www.ErrolZimmermanfoto.com) began during his college years, and he has completed editorial and corporate photography assignments since the 1970s. In 1988 he co-founded an organization of professional photographers, Through Each Others Eyes™, which has sponsored more than 50 exchange exhibitions involving photographers in 11 countries around the world (www.teoe.org). Zimmerman serves as a board member and past president of the organization, which this year celebrated its 30th year of helping people understand and appreciate cultures different from their own. In 2006 Zimmerman, with his wife, Carolyn, purchased a home in Álamos, and since that time he has worked with the Álamos History Association to build a collection of historical and contemporary photographs—and transfer that collection to our website, www.Alamoshistoryassociation.org). she later transcribed, and she and her friend also created a protected historic district for the Townsite neighborhood of over 200 properties west of Flagstaff’s downtown. Later, she was instrumental in developing the Flagstaff Historic Properties Townsite Community Land Trust to preserve historic homes and make them affordable for Flagstaff residents. She began her career in conservation education with the City of Flagstaff in 2003. Her final position was as Water Conservation Manager, but she began by developing environmental education programs including the Recycled Art Exhibition and the Compost Bin Distribution. Ellen and her husband enjoy traveling in Latin America, appreciating its art, architecture, and culture. 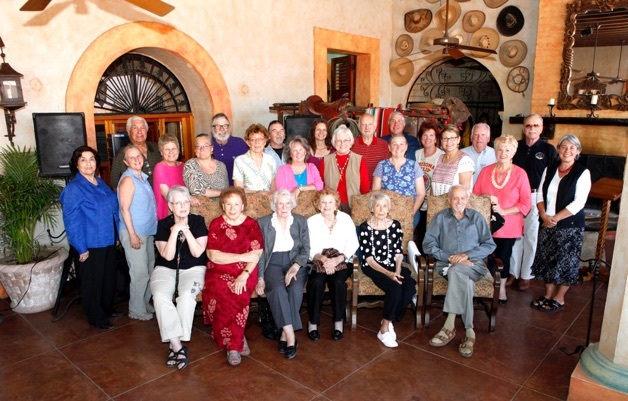 When they retired, they moved to the Sonoran community of Puerto Lobos, north of Libertad and Bahía Kino, and they first came to Alamos in 2013—which has become their annual winter home. •Location - Call to order at Café Luz del Sol at 10:35 a.m.
•Number of members present - 25 present or by proxy, meeting the requirements for quorum. Total number of members is 30. •Motion to approve appended March 9, 2017 Annual Meeting minutes, Steve McKelvy. Seconded, Elson Miles. Unanimously approved. A. Treasurer - Ellen Price. There are $18,710 pesos in the account. $5000 pesos were moved to the Pantheon Fund to be held in reserve. $282 pesos were paid to Linda Adams for the Day of the Dead Altar. Motion to approve Treasurer’s Report, Ellen Price. Seconded, Elson Miles. No discussion. Unanimously approved. B. AHA Board, President - Ellen Price reported for Pam Price. In December, 2017, there were five Board members. Gail Morden relocated out of Alamos, and Ellen Price took on Gail Morden’s Treasurer duties. Gerry Blackman and Sassy Hardy joined the Board, but Gerry had to relocate out of Alamos. Ellen Ryan then joined the Board. C. Program Committee - Ellen Price. Number of meetings/programs - 15 meetings and programs were held. Location of meetings - Eleven at Cafe Luz del Sol, one at the Museum, one at the Bours Community Center, one at Sherry Hale’s home, and one at the Itesca School. i. Anza Awareness - Steve McKelvy. Four years ago the committee began searching for funding for a plaque to be located at the museum, but it wasn’t until Steve met with the supervisor of Tony Estrada that he learned how to submit a proposal for funds from the state. Around one hundred artists receive funds, including FAOT presenters, for cultural and artistic events or programs. Steve suggested applying for these funds, and applications are due in August. He is asking for help to put together a proposal with a budget of around $30,000 pesos which can be submitted online. Mike Foster and Dan Clancy are assisting. Matching funds may be available from the mine. The plan is to create a movable informative banner depicting the Anza route. This Board could be completed in time for display at the Anza Conference in October 2018.
ii. AHA Library, archives and interviews - Sassy Hardy. Sassy will maintain the library and has been busy organizing the room, creating additional storage and signage, and working with Errol Zimmerman on the photograph collection. Sassy provided Joan’s report. Fifty-four books were added. Four books are missing, though, which include The Sudden View, Silvia Bedford, 1953; Conquest of New Spain, Bernal Diaz del Castillo, translated by J. M. Cohen, 1963; History of Mexico, from Prehistoric Times to Present Day, Stella Cicero and Carmen G. Blazquez, 1987; and Twenty Centuries of Mexican Art, Museum of Modern Art (NY), 1940. These books were of more worth to the collection than the 1 previous one that had gone missing three or so years ago. Cataloging continues on newspaper articles. A list of desired books will be produced. Ellen Ryan is transcribing the oral interviews. The DVD’s are available, but some DVDs are not in a format that can be accessed. Work will be done to make them more available and the transcribed interviews will be available as they are completed. Any donations for the AHA research library should be placed in the box under the desk in order to differentiate them from general books for sale at Kathy’s Korner. iii. Panteon Adopt a Grave - Ellen Price for Linda Adams. Linda requested suggestions of names for the altar in honor of a member of the foreign community. Linda Hellman suggested Mary Ayers and Lynne Wiedman suggested Sharon Wickson. Both Mary and Sharon were involved with Las Comadres and the Amigos de Educacion house tours. iv. 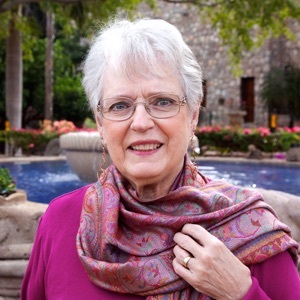 Guide to Historic Alamos - Ellen Price for Pam Price. Pam is editing the guide, Tony Estrada will be asked to review, and a translator will complete the Spanish text. v.Historic Photo archive - Sassy Hardy for Errol Zimmerman. Errol Zimmerman is applying to INAH for approval to scan the Museum’s photographs. Ninety images of Alamos people and families have been collected by Juan Casanova of Hermosillo, who is archiving them for the Cultural Institute of Sonora. Errol continues to maintain our website, and he is working with Juan to place these and other historical images on the site. IV . OLD BUSINESS: Proposed amendments to Bylaws - Ellen Price. Motion to approve mended Bylaws, Steve McKelvy. Seconded, Lynn Wiedman. Discussion. Joan Powell suggested that the Directors at Large language in Section V read, “At least one (1) or more Directors at Large shall be appointed by the Board. These Directors may also serve as Committee Chairs.” Unanimously approved to amend the Bylaws with the additional change. 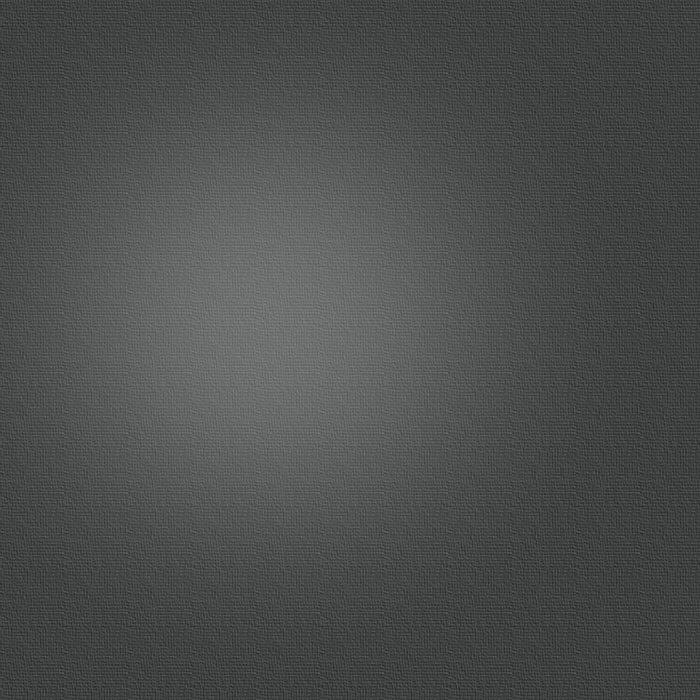 V. NEW BUSINESS: (No action can take place on new business.) Sally requested continued AHA programs into the summer. The Board can discuss this at the next meeting. VI. BUSINESS MEETING: Motion to adjourn the meeting, Steve McKelvy. Seconded, Joan Powell. Meeting adjourned at 11:26 a. m.
A report on the recently concluded Anza Society Conference and an outline of the proposed new guidebook to Álamos were two important subjects discussed at the Third Annual Meeting, held Thursday, March 17, at Luz del Sol Cafe in central Álamos. Álamos History Association President Jim Toevs outlined the program of the 21st annual Anza Society event, which include presentations by Álamos History Association members Steve McKelvy, Joan Powell, and Katherine Callingham on different aspects of Álamos’ history. The Anza conference brought a bus-load of visitors to our community March 3 - 6, and included a presentations by Naomi Torres, National Park Service Superintendent of the Juan Bautista de Anza National Historic Trail. 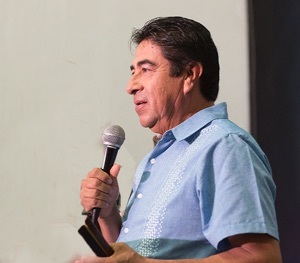 Álamos historian Juan Carlos Holguín Balderrama gave two presentations during the two-day event. Work is underway to provide a wall map of the Anza trail in the Museo Costumbriste de Álamos, and a standing committee has been established for related Anza projects relationg to the importance of Álamos in the 18th Century California expeditions of Anza and Rivera. Association member Joan Powell has research which shows that at least 89 people of Álamos descent were residing in California in 1790. The proposed guidebook, expanding upon information provided in the most recent Álamos guides, will be a 120-page 8.5 x 7-inch publication with a plastic spiral binding. In addition to information on what to see and do in Álamos, it will have information on the geological history and environment of Álamos, the social environmental history to include indigenous communities, European explorers, and the area’s mining history, and information on the 18th and 19th Century structures still remaining in Álamos. A Navojoa printing company has given an estimate for the printing of 500 copies, and partial funding through a grant is currently being sought. A standing committee will oversee this proposal. In other presentations during the annual meeting, Diane Carpenter spoke on the interview project, invited members to do interviews of interesting people and get them scheduled for programs during the 2016-2017 year. 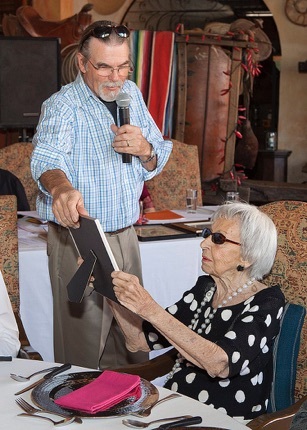 Trini Rangel will continue to organize student interviews of their oldest living family members. Geri Lea reminded the History Association that caring for the graves of foreigners in the Álamos panteon is a year-long commitment. While most foreign graves have sponsors to clean them during the year and decorate them for the November 1 -2 celebration of the Day of the Dead, Geri noted that any member of the association interested in this project should contact her as some graves have no sponsor. A new five-member board of directors for 2016 - 2017 was elected by acclimation. The new board will consist of current members Ellen Price, Pam Price, Trini Rangel, and Gail Morden with Errol Zimmerman joining as a new member of the board. Errol had previously served a term as a board member. 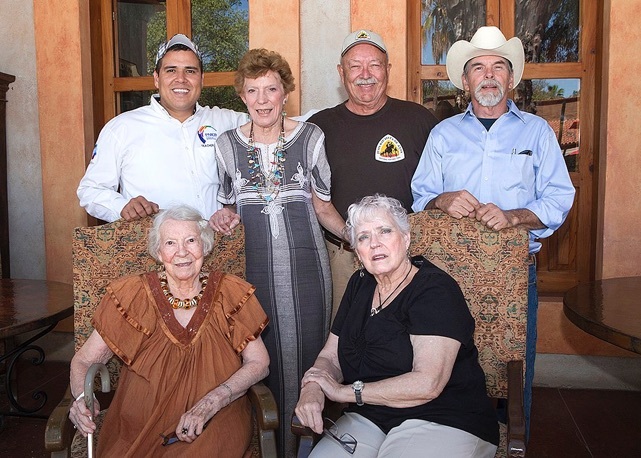 The upcoming 2016 Anza Society conference was the focal point of discussions during the Third Annual Meeting, held Thursday, March 15, at the Agave Cafe at the Hacienda de los Santos in Álamos. Steve McKelvy, a member of the steering committee for the Anza Conference, talked about a preliminary, portable display to be set up in the museum in time for the March, 2016, conference here in Álamos, marking the routes of the Anza and Rivera expeditions. Proposals were sent to local artists and it was hoped that the History Association could pay for a two or three panel display. 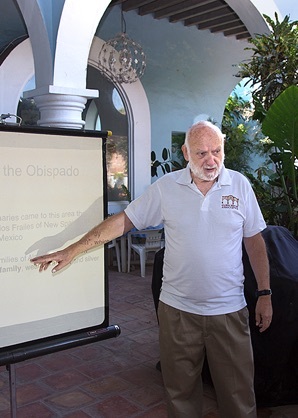 Jim Toevs, President of the History Association, said that the long-term goal for the conference was to substantiate the role of Mexico—specifically, Álamos—in the founding of one of the largest states in the U.S. Among the suggestions for the upcoming conference was the possibility of using the Bours Center for conference meetings and having a commemorative AHA t-shirt for conference members. A placque to be placed permanently on the Plaza de Armas with information on the Juan Bautista de Anza expedition and Álamos’ role in it is being considered, and Steve McKelvy said that Álamos city hall was “on board.” Jim Toevs added that he was in contect with Stella Cordoza, the President of the Anza Society, regarding transportation from the U.S. to Mexico for conference attendees. The company South of the Border Tours was expected to give an estimate on taking conference members from Tucson to Álamos. In other reports at the annual meeting, Pamela Price reported that a proposal for a new Álamos guide book had been sent to the general membership with many comments and suggestions coming back to the committee. Pamela also noted that more local community members were joining the History Association, and that a student membership rate had been discussed as a means of getting youth and college students involved in our projects. In an effort to build our collection of historical photos, Pamela Price talked to Stephanie Meyers about contacting the Urea family in Navajoa, who have old Urea family photos from the days when the Urea family was prominent in Álamos . Pamela also reported that Beverly Krucek's boxes of History Association materials, which were at her home at the time of her death, have been delivered to Research Library at Cathy's Corner. Unfortunately, the materials have not yet been organized, which will be a large task in need of a volunteer! Gail Morden said that she has four History Association golf shirts to sell—two extra large and two medium. More shirts in several different colors will be ordered in the future. The members of the History Association unanimously approved a slate of seven board members for the year: Jim Toevs, Steve McKelvy, Gail Morden, Trini Rangel, Diane Carpenter, Pam Price, and Ellen Price. Officers will be determined by the board at its first meeting. Trini Rangel, Ellen Price, Jim Toevs, and Steve McKelvy. Seated from left are Leila Gillette and Gail Morden. History association members enjoy lunch at the Agave Cafe after the second annual meeting. Bev Krucek (above) was one of three awarded lifetime memberships to the Álamos History Association during the first annual meeting March 14. 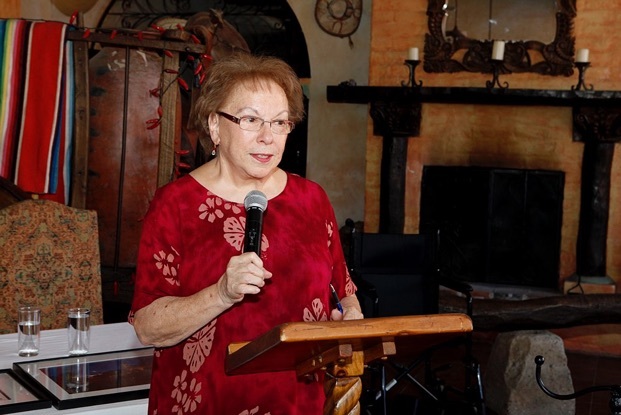 In 1994 Bev started the organization because of her desire to learn more about the rich history of the community, and she has worked tirelessly since that time to collect and preserve information on the pueblo and municipio and the families who created its 300-plus year written history. Leila Gillette and Jim Swickard also received lifetime memberships for their dedication to the Association. Leila was one of five who attended the first meeting in 1994. 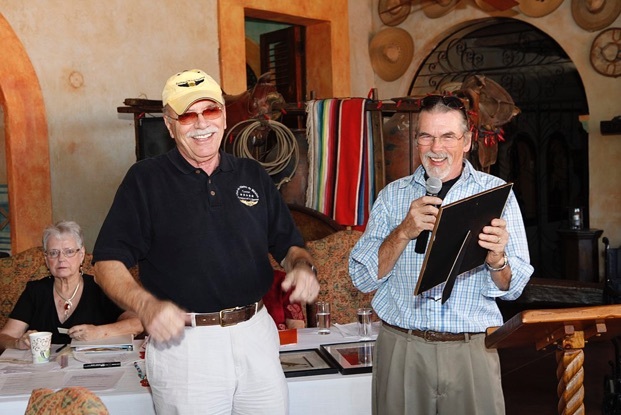 Member Diane Carpenter addresses the group (top), and Steve McKelvy hands a lifetime membership award to Jim Swickard, owner of the Hacienda de los Santos Resort in Álamos. •There were 12 members present, not enough for a quorum. The minutes from the last Annual Meeting were approved. The treasurer, Gail Morden, reported that there are 19,780 pesos in the AHA account. She announced that she will henceforth not deal in centavos, but will round off sums. The board has sanctioned 5,000 pesos for the repair of damaged expat graves in the panteón. The president of the board, Pam Price, reported that the AHA board had held five meetings, including one last March after the election of the new board. Holding meetings at Luchy’s café and once a month at a historic building have proved successful. Three new standing committees were established this winter: one for 1) the AHA library, archives, and interviews, 2) Adopt-a-grave, 3) History association photo archives. The next election for the board will be in the spring of 2019. The chairman of the Program Committee, Ellen Price, reported that the AHA visited five historic buildings this season, and that people are encouraged to make presentations on topics of interest to them. Adopt-a-grave committee - report by Linda Adams - It was agreed that Linda would make an altar for the Day of the Dead to honor Twyla Harkness, and that at the first AHA meeting in the fall the adopt-a-grave program would be explained and discussed. Guide to historic Alamos committee, report by Pam Price - Analilia Reina has been asked to translate the English textof the new Álamos guidebook being prepared by the History Association, which the committee hopes will be ready next winter. History association photo archives committee - report by Pam Price for chair Errol Zimmerman. With the cooperation of Tony Estrada the pictures in the museum will be scanned and ‘rephotographed, ’and the committee will also work with Juan Casanova of the Cultural Institute of Sonora in archiving portraits and snapshots from Alamos families. Photographer Anders Tomlinson also left a set of his photos and videos for the AHA archives. 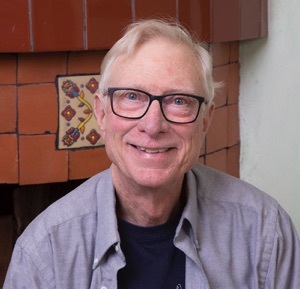 Anza awareness committee, report by Steve McKelvy - Jim Toevs is attending the annual Anza association conference and will ask the association if it would like to meet again in Alamos next year. The business meeting was adjourned and followed by a presentation by Diane Carpenter, ‘Indigenous Peoples of the Americas’. 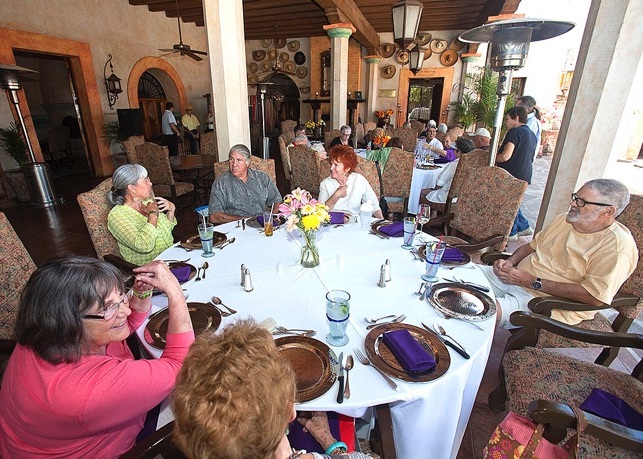 Bylaws were adopted and the first official Board of Directors was selected at the first “annual meeting” of the Álamos History Association, held Thursday, March 14, 2013, in the Agave Cafe at the Hacienda de los Santos resort. Moderator Steve McKelvy also presented lifetime Association membership certificates to association founder and director Bev Krucek, charter member Leila Gillette, and longtime member and active association supporter Jim Swickard. Although the Álamos History Association was founded in 1994 and has met weekly for the past 18 years under Bev Krucek’s directorship, it lacked approved bylaws and an official board until the March 14 meeting. Board members selected March 14 for one-year terms were as follows: Jim Toevs, Trini Rangel, Ellen Price, Gail Morden, Leila Gillette, Samme Chittum, and Errol Zimmerman. Trini, Gail, Leila, and Errol were members of the provisional board (on this website) which has governed the association for the past few years, while Jim, Ellen, and Samme are new members to the board. 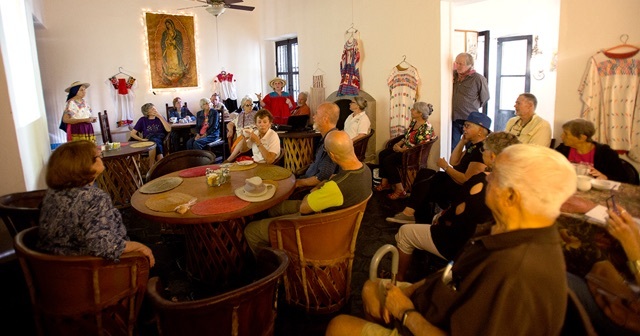 Following the meeting, the group enjoyed a delicious lunch at the Agave Café and Galería at the Hacienda, where the History Association holds its weekly meetings. Please enjoy viewing six additional pictures taken at the event, all courtesy of Association member Bob Rink. TOP: Director Tony Estrada outlines the history of el Museo Costumbrista de Sonora during a 2017 meeting of the Association. BELOW: Dr. Craig Fisher talks about his home, the Bishop’s House, in a 2016 presentation. Ursula Beltrán presents the history of “huipiles,” the traditional clothing of indigeneous Mexican women March 14, 2019 (top) and club members listen as President Pam Price discusses governance and society in18th Century Chihuahua during the January 10, 2019, meeting of the Association. After retirement, there was more time to do things for fun – bird watching, photography, and genealogy! She enjoys taking photos of birds and butterflies, and researching in genealogy databases. Joan and Marta Reents divide their time between Álamos and Green Valley, AZ. Joan’s first trip to Alamos was in May 1976, to visit Hildred Aragon (Marta Reents’ mother), who lived here. Marta and Joan came back a few times in the following years and, after retirement in 2007, they started coming to Alamos regularly in the fall and winter. They always attended the Alamos History Club meetings when in town. 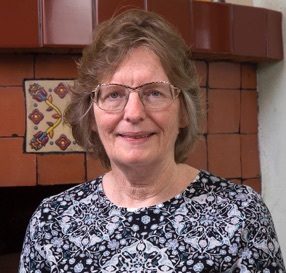 Joan’s interest in genealogy led her to explore some of the records available online for Alamos in earlier times, to study the relation of Alamos to the settlement of California, and to a growing involvement with the Alamos History Association. Former Association President Bev Krucek asked for her help in cataloging the books for the AHA Library, and she has enjoyed seeing the variety of books and other materials that have been donated to this collection.